An unhappy businessman finds a new sense of purpose after he's tasked with helping a quartet of ghosts fulfill their last wishes before moving on to the afterlife. 1 win & 10 nominations. No one can forget this movie. Caution: While this story casts cynicism aside, it takes a bit of patience to follow. 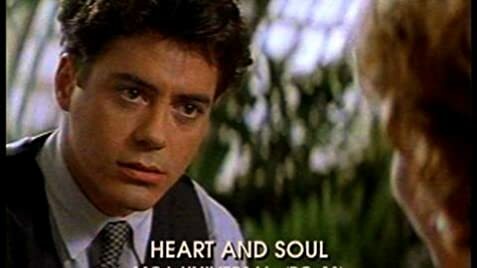 Downey is the only cynic in the film (at least in the beginning), but after his special encounters with four 'heavenly' strangers, his life is changed, perhaps for the better. That's the beauty of this movie. It is handled with deft physical comedy (Downey's table-tumbling at a stuffy board meeting as the result of souls invading his body is on a par with Chaplin and Keaton), but it is also one of the most loving stories with truly loving characters (even Sizemore) I've ever seen. The four vignettes with Sizemore (making a former bad deed right), Grodin (overcoming stage fright), Woodard (finding her children), and Sedgewick (tracking down the one that got away) are quite nice, even bewitching. Bewitching is the only way I can describe a moment like Woodard's recognition of a lost son or Sedgewick being granted a moment of mortal embrace- even if just for a second or two. This film will make you shed a few tears, if not downright bawl, but you'll be smiling- and that's no matter how many times you watch. So watch. Smile. Show your teeth. Some of the literal English language translations of this film's foreign language titles, according to the "Robert Downey, Jr. Film Guide" website, are: Argentina: El Amor es Eterno (Love is Eternal); Brazil: Morrendo e Aprendendo (Dying and Learning); France: Drôles de fantômes (Funny Ghosts); Germany: Vier Himmlische Freunde (Four Heavenly Friends); Israel: One More Chance for Life (English translation); Italy: Quattro Fantasmi Per Un Sogno (Four Ghosts for a Dream); Japan: When Love is Smiling (English translation); Poland: Serce i Dusze (Heart and Souls); and Spain: Corazones y Almas (Heart and Souls). Harrison Winslow: Who came up with this ridiculous concept anyway? Resolve your entire life in one bold stroke? What if I fail? And I will. I'll fail. I'm telling you. I always fail. Then my whole life will be a complete failure.